Bacteria often assemble and use hair-likeorganelles known as pili or fimbriae on their cell surface to quickly and effectively mediate attachment to the host surfaces.This initial attachment is the critical event in bacterial colonization, which may benefit or harm the host depending on nature of their relationship.Dr. VengadesanKrishnan’s structural microbiology research group has begun structural investigations towards understanding how the beneficial or probiotic bacteriahave evolved to utilize pili to adapt the gut environment for survival.As part of their ongoing research, Dr. Krishnan’s group has recently discovered the crystal structures of a building block that bacteria use to build pilus fiber. This study, for the first time, identified two different shapes (linear and bent) for the building block.The bent shape which was never seen beforelikely represents an intermediate snapshot of the building block during process of building pilus fibers. Biophysical and bioinformatic analysis of the two shapes support the flexible nature of the bent shape and its necessity during pilus polymerization. 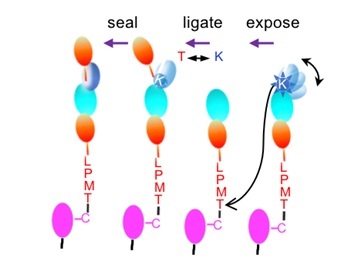 Based on the shapes of the building block and interpretation, they suggest a three-stage model called Expose-Ligate-Seal mechanism to define the process by which bacteria could covalently dock the blocksto assemble pilus fiber.